I am a fisheries project officer for the Environment Agency, before that I also worked for the National Rivers Authority, and I have been involved with fishing for over 13 years. I started life as a water bailiff, a job that I had always wanted to do and which was a million miles away from my time crewing super yachts!! I enjoyed the role as a bailiff and was lucky enough to be involved in some unusual and high profile cases, including prosecuting a magistrate for poaching and an incident one night where we caught some poachers in a car park in Keswick with the help of the police. We caught them red handed with 64 salmon and a sea trout in the van they were driving! In recent years my role has changed and I am lucky enough to work with some great local organisations and people. They have helped to improve river habitats, got more people fishing and protected fish throughout Cumbria and the Borders. What I find most rewarding about my job is the diversity of my role and the people I get to meet. We have a whole raft of partners that we work alongside to deliver projects, some of the big organisations like Natural England, Lake District National Park and the Forestry Commission, but we also work with small angling clubs and associations, rivers trusts, local schools, and schools as far away as Nottingham, who always like to learn about and get involved in our habitat improvement projects. The key to creating a better place is working together. I have found that by working together with local partners and local communities, we have been able to do more to improve local habitats and help support sustainable fisheries throughout Cumbria and the Borders. joining forces with the apprentices and the special needs students of Oak Field School from Nottingham on a tree planting day in the lake District and working alongside them to improve the natural environment in our beautiful part of the world. I am very proud to be running the West Cumbrian Schools Sustainable Fisheries Education Project with Active Cumbria and the Derwent Owners Association. This year five schools in West Cumbria are involved. 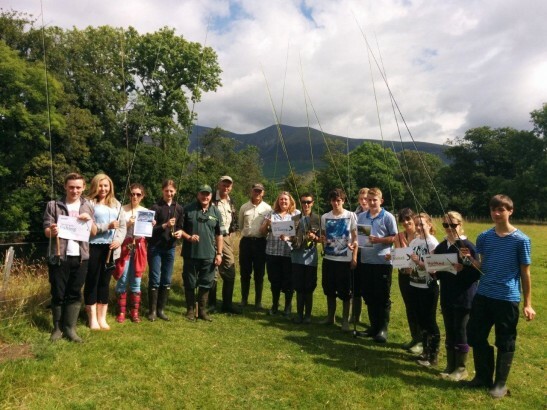 The aim of the course is to promote best practice and etiquette while fishing, alongside educating pupils about environmental and fish welfare issues. The course was also devised to reduce out of season fishing which has been an ongoing problem in our West Cumbrian rivers. When the students complete the angling education course, they will receive a free permit to fish a local water as well as a free fishing licence, so hopefully they will have a great summer of fishing to look forward to when they are on their holidays. By working with local organisations, I have got more kids into fishing, highlighted our work to local anglers and hopefully given the kids a focus over the coming years. One of my current projects is the Pearls in Peril EU Life Project. For this project, I work with the West Cumbria Rivers Trust. It’s a four year project on the River Ehen; I grew up by this river and I am very fond of it. It a place of great memories for me, I was shown how to fish on this river from the age of eight by my family. As the saying goes, I know it like the back of my hand, and that knowledge has come in handy when helping this project to protect the fresh water mussel population. We have had some great successes so far improving the river habitats with the help and support of our partners on the project. So, if I were to leave you with anything, it would be that together we can achieve more. I now have great relationships with local organisations and many local people and because of this we are doing more to improve the local environment and protect our fish than ever before. For anyone interested in trying fishing, have a look at this FishingInfo.co.uk It’s the new website launched by the Angling Trust to provide information about where to fish, local tackle shops, coaches and clubs. 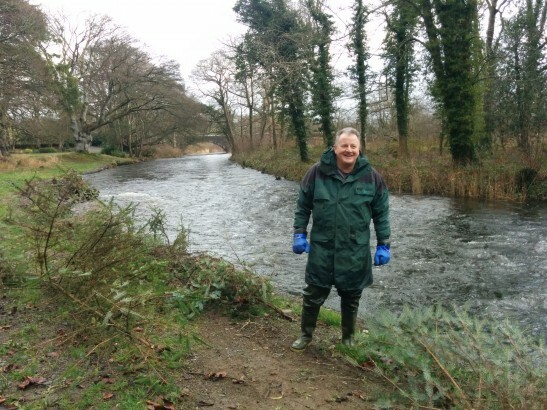 Mike Farrell is a project officer in the Cumbria and Lancashire fisheries team. He has worked for the Environment Agency for over 13 years. When he’s not at work, you will probably still see him fishing waters across the Lake District with a big smile on his face and saying hello to everyone he meets. I have had the pleasure of working with Mike on several projects I have been involved with on the river Derwent. His dedication, enthusiasm, and help he has provided is second to none. I wish we had many more like him.